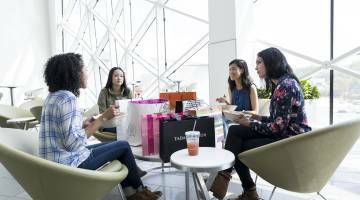 The King of Prussia Mall is New York fashion chic without the hassle of Manhattan travel. The mall is the largest retail space in the U.S., with more than 400 stores like Nordstrom, Macy's, Neiman Marcus, Bloomingdale's, and Lord & Taylor. The King of Prussia Mall sets the bar high in terms of variety and service, and the smaller boutiques follow through to the nth degree. It is the solo representative in Pennsylvania of high-end brands such as Stuart Weitzman, Hugo Boss, Jimmy Choo, Fendi, Louis Vuitton, Gucci, Cartier, Carolina Herrera, Tory Burch and Hermès. With such varied shopping options, it&apos;s no wonder that the King of Prussia Mall has become a holiday shopping destination for more than 5 million people every November and December. Three food courts cover the range of culinary options from quick-serve and fast food to luxurious sit-down steakhouses. And an IMAX theater provides a big-screen entertainment option to shoppers who want to take a break. Looking at it today, it is hard to image that the King of Prussia Mall had humble beginnings: At its 1963 opening, one of the big draws was a local grocery store, and the connecting walkways were outdoors. But visionaries continued to expand the footprint and today, the Mall&apos;s 2.6 million square feet of retail space welcomes 25 million visitors a year. More retail space is on the way as the mall is in the middle of yet another expansion project to provide an even greater variety of shopping options. Despite its size, the King of Prussia Mall maintains a personal touch that enables shopping to be an experience, not a chore. Parking lot shuttles, "stay and shop" hotel deals and even a free personal shopper/style consultant are all perks. King of Prussia Mall is more fun with more people. Group tours of 10 or more people can register to receive special discounts from the Mall. Visit the King of Prussia Mall&apos;s Official Page and follow the Group Tour Reservation link to register your group (you will need to create an account, if you have not done so already).